Martin Samarco decided two switch teams in de Pro A in Germany this year. 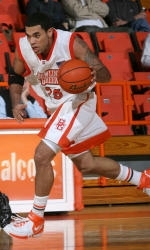 Martin played for Paderborn last year, but will suit up for BG Karlsruhe coming season. Last year Martin averaged 16.9 ppg and had one of his best performances in a win over Karlsruhe where he scored 31 points. Headcoach Tino Stumph says: “Martin is my absolute wish player. I am so happy that such a good Pro A player that gives us a different quality on offense and defense decided to come to Karlsruhe. Webmoebel Baskets from Paderborn started with a win in 2011. 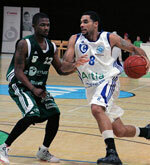 They beat Cuxhaven Bascats with 99 -62. In a game where Paderborn dominated the whole game, they where lead by Scorers1st client Martin Samarco. The other Scorers1st client on the roster, Benjamin Fumey, didnt get to play out of precaution. There was no need for coach Glasauer to use him in this game and therefore he didnt get on court. In the first quarter the Bascats still believed they had a chance in this game, because they were trailing Paderborn closely. But when the team from Paderborn paced up the game and Martin Samarco started hitting his shots they were trailing 16 points at halftime 48-32. In the second half the Webmoebel Baskets came all fired up out of the lockerroom and ready to finish the game. Which they did with high intensity and high paced, much to the delight of coach Glasauer. Final score 99 -62. Martin Samarco ended up with 25 points for the team from Paderborn. In his first game for Webmoebel Baskets Paderborn, Scorers1st client Martin Samaraco contributed to the win over the Kirchheim Knights. The team from coach Glasauer was able to clinch their third win in a row, slowly climbing up the table. The team from Paderborn started the game slowly, losing the first quarter, only to return in the other three quarters and win all of those three and bring home the win putting 89 -73 on the scoreboard. ” I think in the second half we clearly the clearly better team and just wanted to win the most. We controlled the rebound and played together well. We are on the right track” stated a delighted headcoach Glasauer. Scorers1st client Martin Samarco contributed with 11 points and client Benjamin Fumey with 10 points and 6 rebounds.